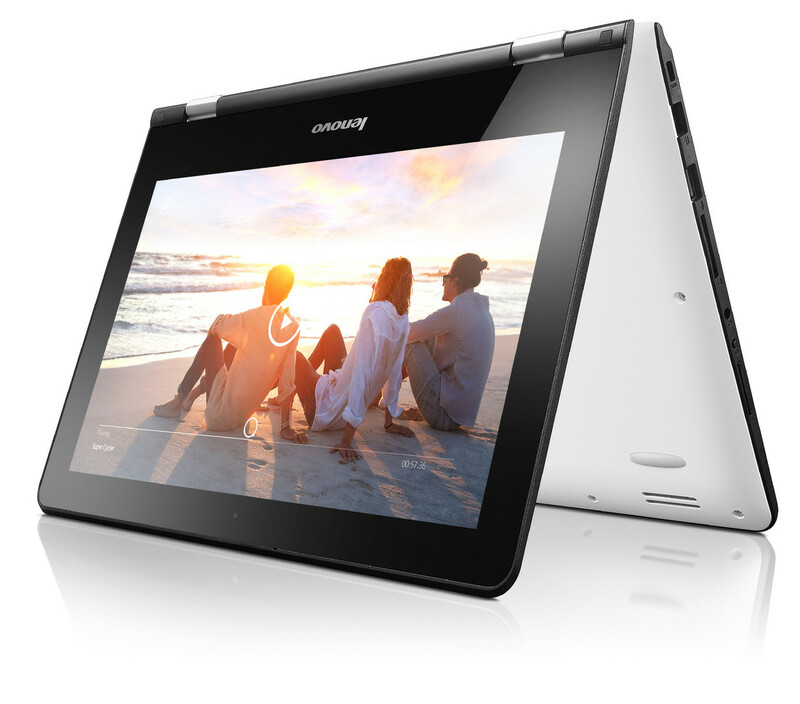 Frequent visitors of our website are probably familiar with the Yoga 300-11IBR already, as it is essentially the convertible edition of the recently reviewed Lenovo IdeaPad 300S-11IBR netbook. This time around, we are checking out the convertible to see if it fares any better - the netbook was not exactly impressive. Competitors are the Asus Transformer Book Flip TP200SA, the Toshiba Satellite Radius 11 L10W-C, and the Acer Aspire R11 R3-131T, but also regular netbooks like the Acer Aspire One Cloudbook 11 and the Asus EeeBook X205TA. The chassis is made from two-tone plastic. The display lid and the bottom part of the base unit are white; all other parts are black. Three sides of the base unit are surrounded by a rubber bumper, which protects the upper base unit when the convertible is resting on it. The display can be rotated backwards a full 360 degrees to allow for different modes. The build quality is quite decent. 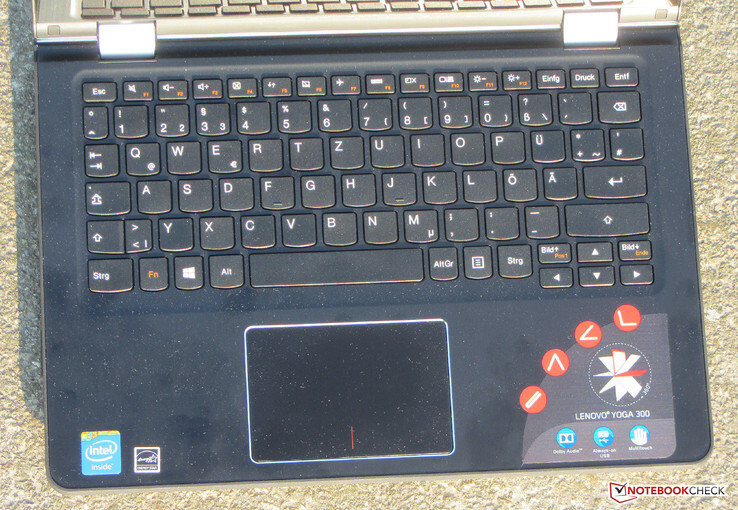 As far as the sturdiness is concerned, the Yoga 300 exhibits the usual weaknesses: the chassis flexes in the areas next to the keyboard and below the touchpad. The base unit resists twisting quite well. To access the hardware, the bottom half of the base unit needs to be taken off, which is an easily accomplished job. 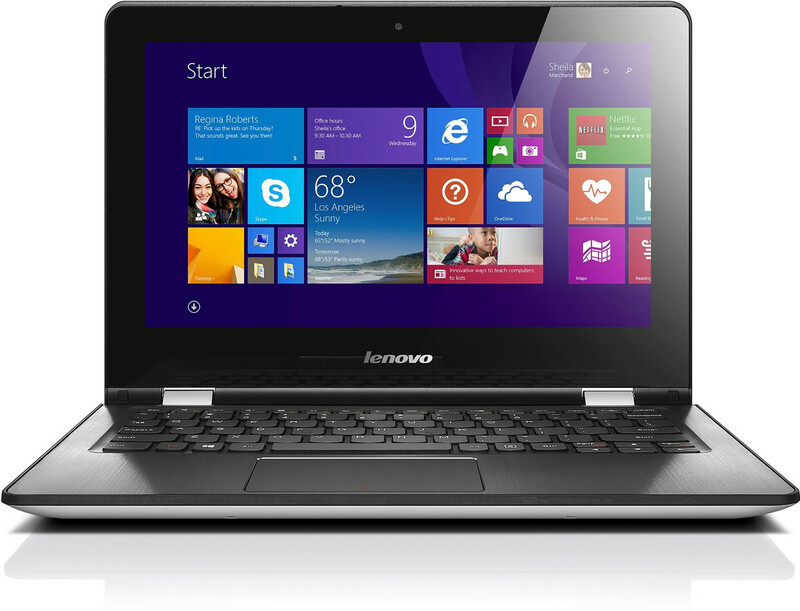 The small notebook features a decent number of ports. One of the three USB ports supports USB 3.0. HDMI out allows the user to connect a monitor or a TV. The physical ports are all located towards the rear on the left and right side. The integrated card reader is about average as far as the speeds are concerned. Large data blocks are copied at a maximum transfer rate of 75.9 MB/s. The copy process of 250 jpeg-files (5 MB each) took place at 33.3 MB/s. 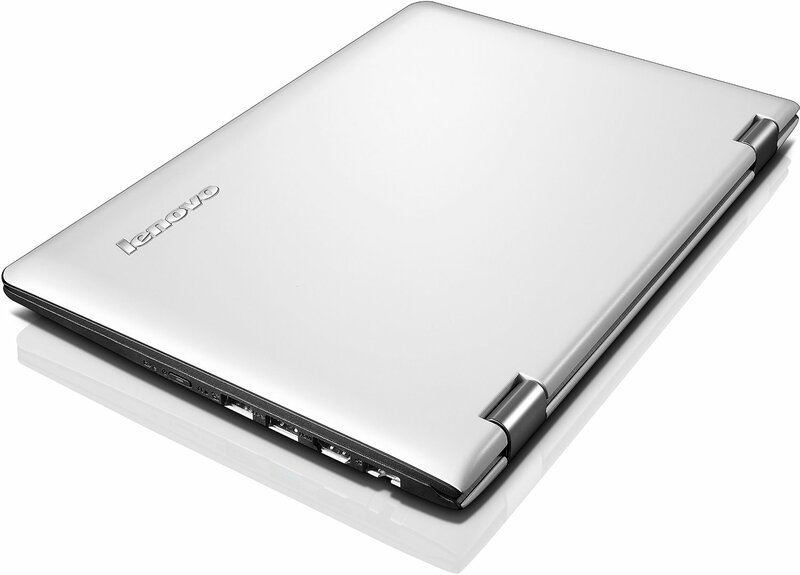 For these tests we use our reference SD card Toshiba Exceria Pro SDXC 64 GB UHS-II. The chiclet keyboard does not feature a backlight. The flat keys are ever so slightly rough to the touch with well-defined feedback and short travel. The keyboard only flexes minimally, so typing is not affected at all. Overall, the quality of the keyboard is acceptable. The multi-touch-capable ClickPad measures about 9 x 6 cm (~3.5 x 2.4 in) and offers plenty of space for gestures. The smooth surface allows fingers to glide easily. The travel distance is short and the feedback well defined. In addition, the convertible also features a touchscreen as an alternative input method. The screen responds instantly and can recognize up to 10 touch points. 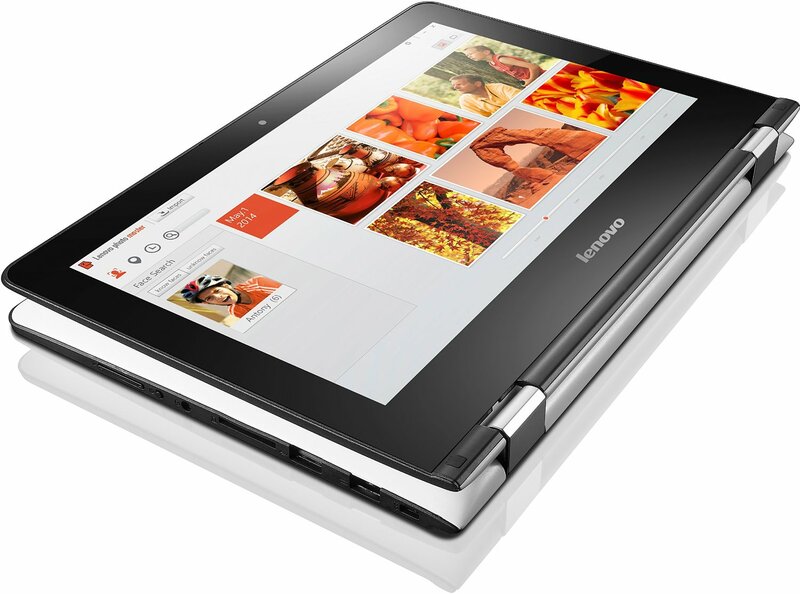 The Yoga 300 is equipped with an 11.6-inch touchscreen with a native resolution of 1366x768 pixels. Neither the brightness (241.6 cd/m²) nor the contrast (376:1) are standouts - an 11.6-inch convertible should offer more, especially since it's likely going to be used in different locations and different ambient light settings. 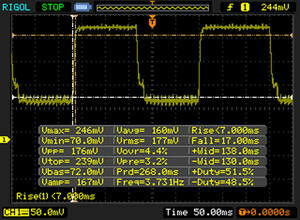 A positive aspect: at no time did we encounter any PWM flickering. As shipped, the color DeltaE deviation is 8.87. The goal is a value of less than 3. 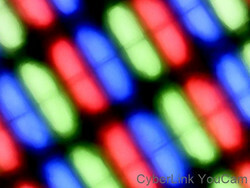 In addition, the display panel suffers from a bluish hue. 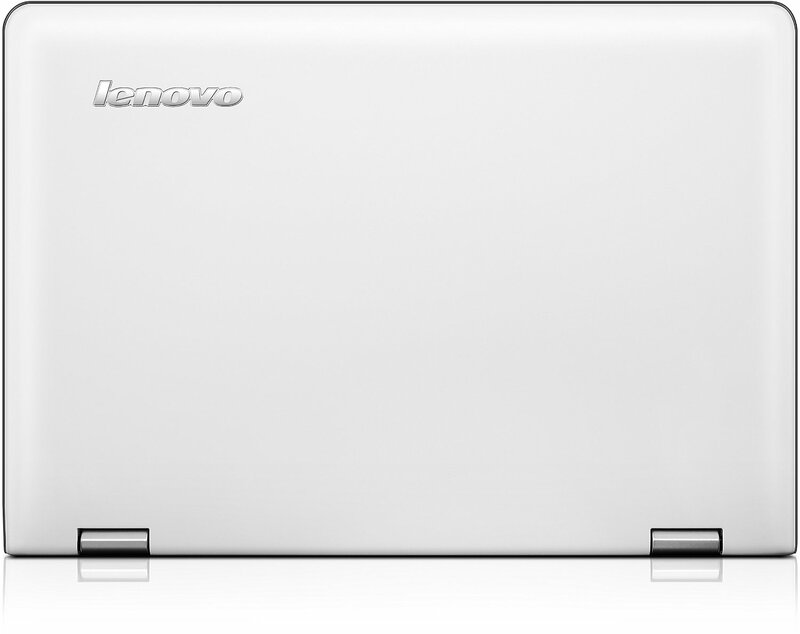 For some inexplicable reason, Lenovo decided to outfit the Yoga 300 with a panel based on TN technology. The viewing angles are therefore restricted, even though this particular display is one of the better ones and the viewing angles are greater than normal. IPS panels are still much better in that regard. The convertible is not easy to use outdoors because of glossy and reflective display in combination with the low maximum brightness. The Yoga 300-11IBR is an 11.6-inch convertible notebook. The hardware is good enough for simple word processing and web browsing. Our review notebook sells for 380 Euro (~$430). Other versions are available as well with the price starting of 300 Euro (~$340). 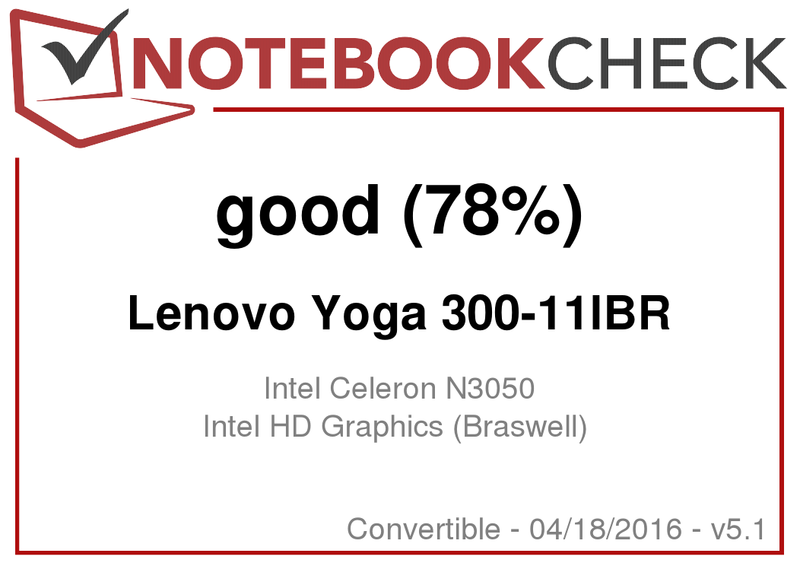 The Yoga 300 is equipped with an Intel Celeron N3050 (Braswell) dual-core processor with a clock speed of 1.6 GHz. 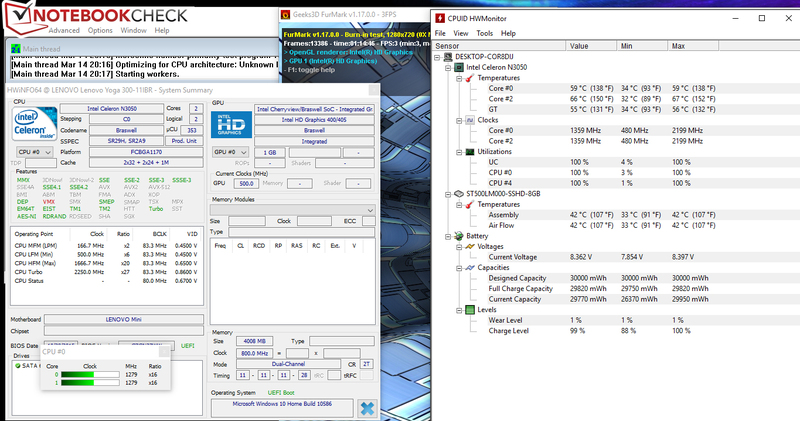 The Turbo can overclock the cores up to 2.16 GHz. The CPU is quite frugal with a TDP of 6 watts, which in turn allows for passive cooling. The Celeron is not exactly powerful and cannot handle much more than simple word processing. During our benchmark runs, the CPU maintained the Turbo-maximum both with the notebook plugged in and running on battery power. The system runs trouble-free and without any stutters. Potential buyers should be aware that the convertible was only designed to handle word processing and similar tasks. Common news and online-shop websites can take a little while to load. The results of the PC Mark benchmark tests reflect the performance of the integrated SoC. The convertible scores better than competitors with Bay Trail hardware thanks to the more powerful Braswell GPU. Swapping out the hybrid HDD for an SSD should improve the overall system performance. The Aspire is equipped with a hybrid HDD from Seagate. The drive rotates at 5400 RPM and has a capacity of 500 GB. The included SSD cache (8 GB) increases the load speed of frequently used applications. The transfer rates are equivalent to normal platter-based 5400-RPM drives. Intel's HD Graphics (Braswell) supports DirectX 12 and operates at speeds of up to 600 MHz. The results of the 3D Mark benchmarks are as expected for this particular GPU. The new graphics card is clearly better than the predecessor Bay Trail thanks to the new architecture. An integrated decoder takes load off the processor during the playback of common video formats. The convertible can even handle H.265 (successor to H.264) 4K videos. When we ran our video (4k, H.265, 60 fps), the CPU load remained under 10%. For our tests we used the movie and TV app Windows 10 comes with, as it supports hardware acceleration of H.265 videos. Users interested in gaming should stick with the casual games available from the Windows Store. Modern 3D games like Rise of the Tomb Raider are out of the question, since the hardware is simply not powerful enough. The SoC is passively cooled, so there is no fan system. The hard drive is audible, although we needed to pay close attention to hear it at all, as this particular model is very quiet. Swapping the HDD for an SSD would result in an utterly silent notebook. The Yoga handles the stress test (Prime95 and FurMark are running for at least one hour) in identical fashion no matter if it is plugged in or not. The CPU (2.16 GHz) and the GPU (600 MHz) deliver the full performance for about one minute before throttling occurs (down to 1.6 GHz and 520 MHz, respectively). 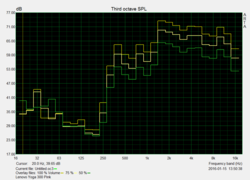 After the initial slowdown, further decreases happen very slowly: after one hour we recorded 1.3 to 1.4 GHz for the CPU and 500 MHz for the GPU. The convertible does not get very warm. All areas remained under 40 degrees Celsius (104 Fahrenheit). (+) In idle usage, the average temperature for the upper side is 24.4 °C / 76 F, compared to the device average of 30.3 °C / 87 F.
The stereo speakers are located towards the front edge on the bottom of the convertible. The output quality is acceptable but not great, as the sound can get a little tinny. 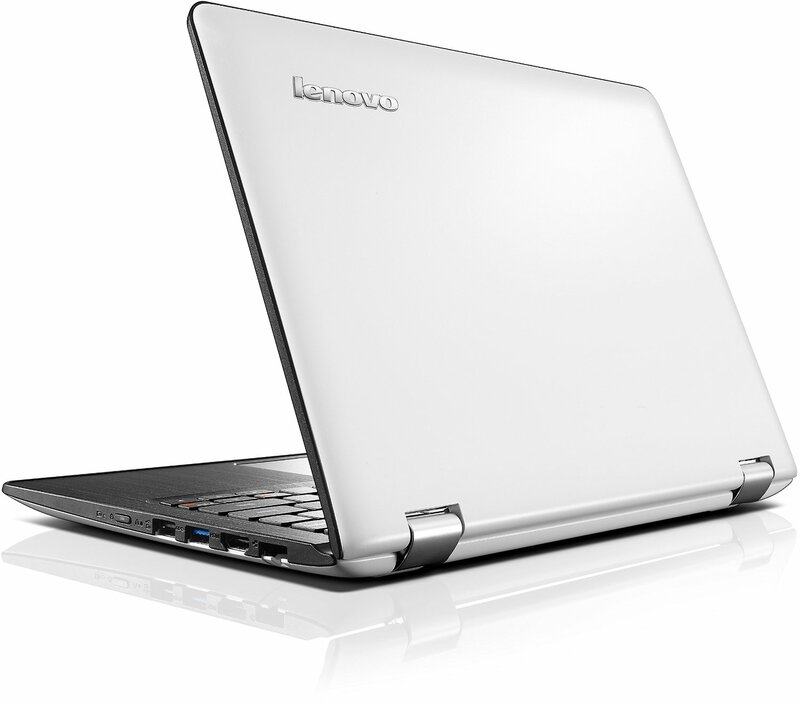 During idle, the convertible consumes a maximum of 7.8 watts - 3 watts less than the netbook sibling. During the stress test, the power consumption increased to 16 watts, which is the same draw we measured under medium load. The reason is the throttling of both the CPU and the GPU performance during the stress test. The power adapter is rated at 45 watts. Our practical WLAN test revealed a run time of 5 hours and 8 minutes. 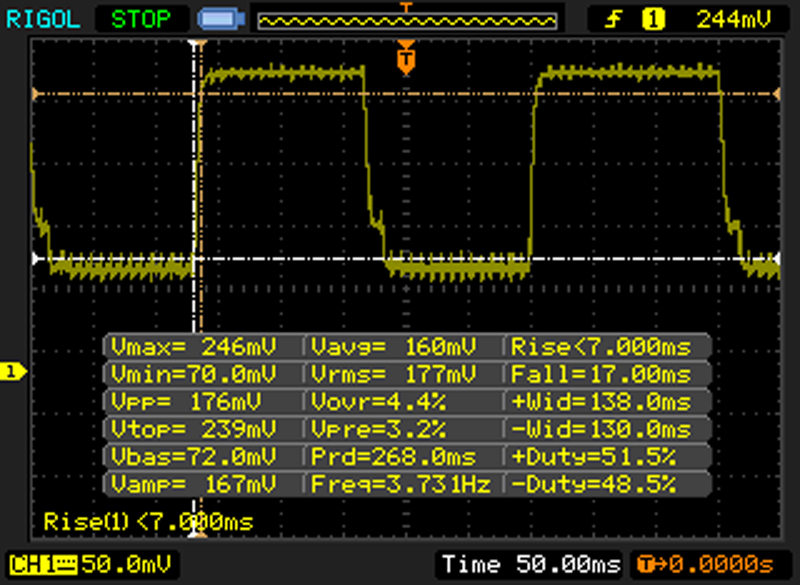 This result matches that of the IdeaPad 300s-11IBR, which shut down after 5 hours and 15 minutes. 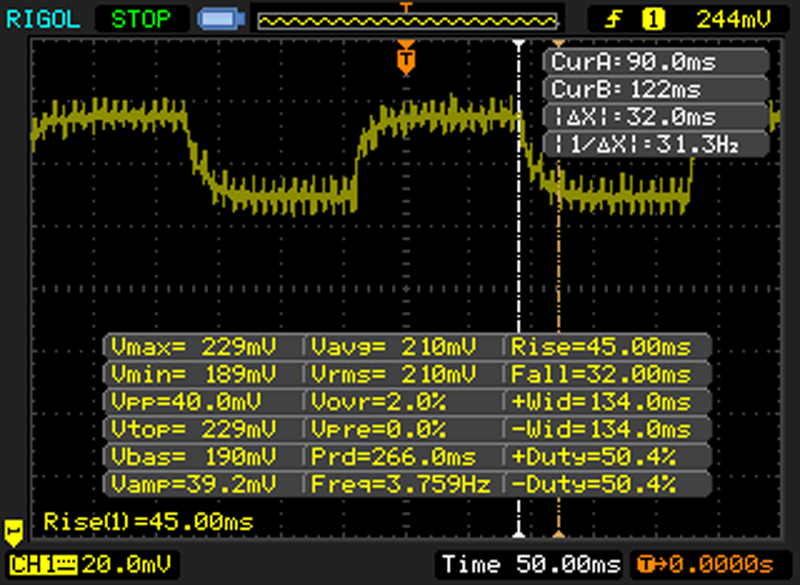 For this test, we use the balanced profile and set the display to a brightness of 150 cd/m². 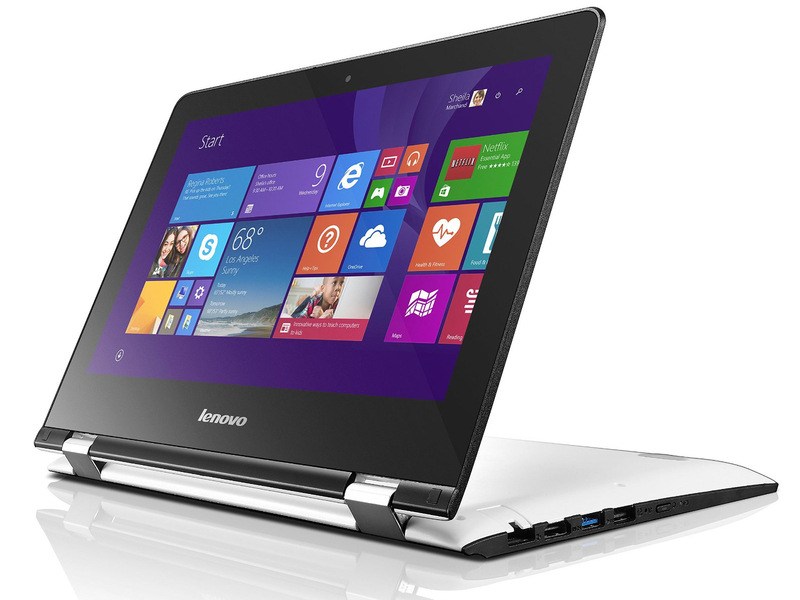 The Yoga 300-11IB is an 11.6-inch convertible designed for simple word processing and web browsing. When connected to a TV, the notebook can also function as a silent video playback station. 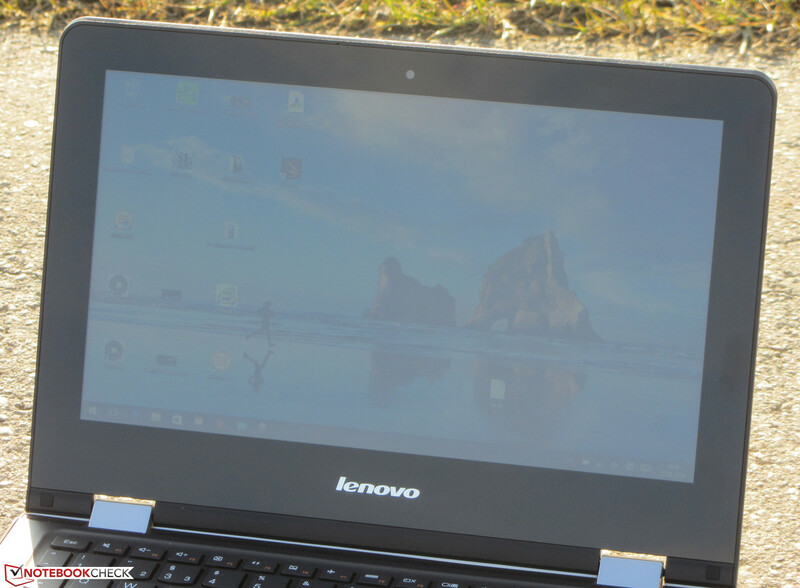 The Yoga 300 is very quiet and does not get hot. The 500 GB hybrid HDD offers plenty of storage capacity. If desired, the HDD can be swapped out for a higher-capacity model or an SSD. The battery life is fairly average; some competitors offer substantially longer run times. 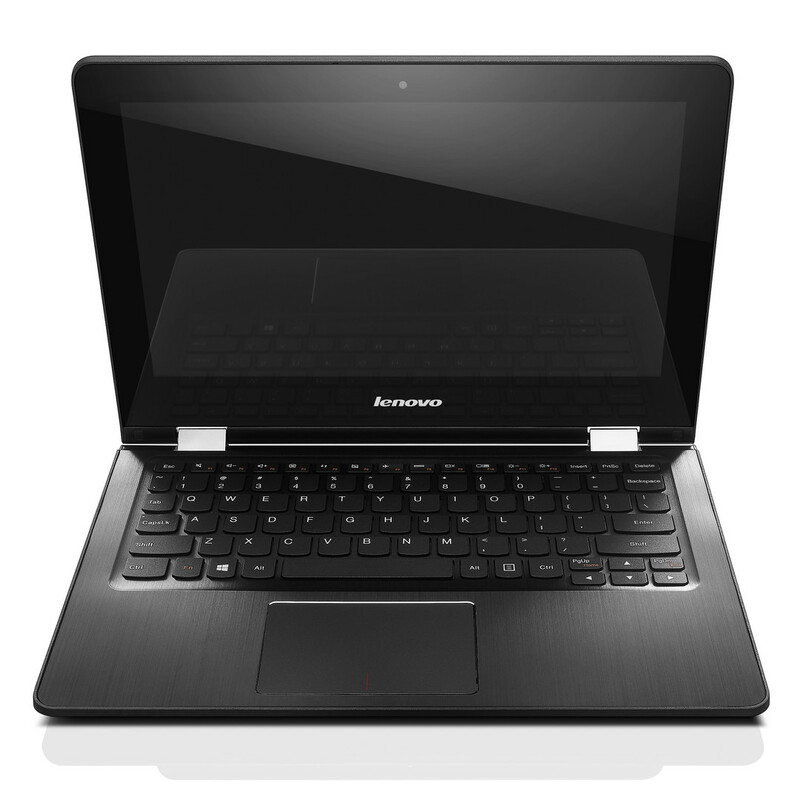 The warranty coverage is also nothing to get excited about, as Lenovo covers the convertible for only one year. 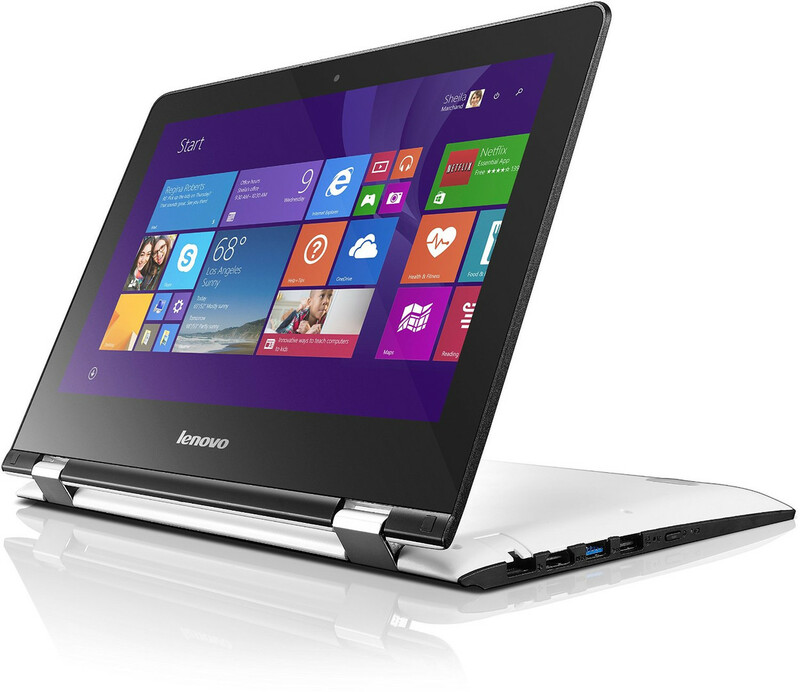 For some inexplicable reason, Lenovo decided to outfit the Yoga 300 with a TN panel. The viewing angle stability is therefore not great. In our opinion, there is no place for a screen based on this technology within the group of tablets and convertibles. Even though this particular screen is better than normal, the viewing angles of an IPS display are much better still.